Please consider supporting In geveb: A Journal of Yiddish Studies. In geveb is not affiliated with any academic or cultural institution and is supported by the donations of individuals and foundations. In geveb is a registered 501(c)3 non-profit organization and all donations are fully tax-deductible. We are excited to announce a new thank you gift for donors: In geveb pencils! Please consider signing up for a recurring monthly gift at any level that works for you and we will send you a dozen pencils as a thank you, one for each month of the year. You can give $4 a month, $18 a month, or anything in between or beyond. Every donation helps. 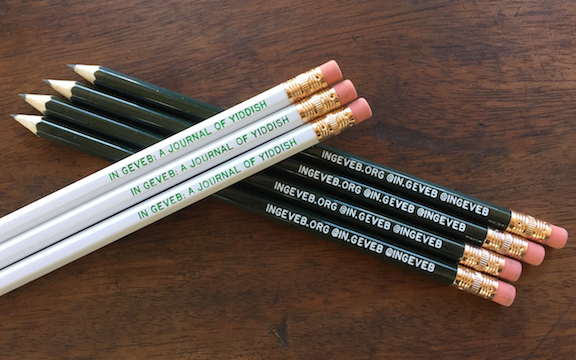 If a recurring donation doesn't work for you but you can't wait to put some In geveb pencils in your In geveb tote bag, we will be happy to send you six pencils as a thank you for any one-time gift of $18 or more. Please make check payable to In geveb. Please also include your full name, address, phone number and email in the envelope. Your donation will enable In geveb to be a central address for the study of all things Yiddish—a digital forum for discussions of Yiddish literature, language, and culture, and the home for the next generation of Yiddish scholarship. We are grateful for your continuing support of Yiddish language and culture.